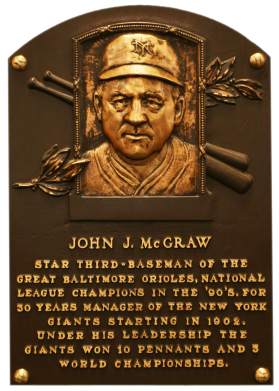 As third baseman for Baltimore in the 1890s, McGraw was talented enough to make the Hall on his merits as a player. 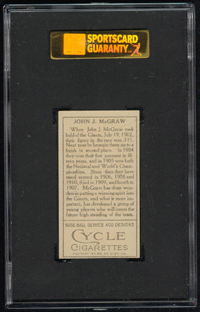 As the Giants manager from 1902 to 1932, he dominated baseball during its "scientific era", and successfully made the transition to the power game of the 1920s. 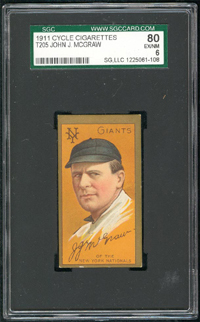 Despite capturing 10 pennants, the "Little Napoleon" won the World Series only three times. A manager for 33 years, McGraw racked up 2,784 victories in 4,801 games, both second on the all-time list to Connie Mack. Comments: I've always had this HOF manager represented by the 1911 T205 issue. My first example, a PSA 3, was replaced with a PSA 4 upgrade in April, 2002. In March, 2005 I upgraded to a PSA 5 with a Sweet Caporal back. A couple months later I was ecstatic to purchase this gorgeous SGC 80 example with a tougher Cycle reverse from SC Gaynor Auctions, Inc on eBay.